Have you ever been in a rut, and only recognized it when you see someone else’s work? I’ve just had that experience. I am, admittedly someone who is still learning SL photography. I’m pretty good on the angles, the lighting, the framing. That’s, fine, but it’s merely the basics. I’ve had this unrecognized itch that my images were lacking punch, emotion, but I wasn’t quite sure how to get around it until I saw this shot by Connie Arida. So it’s very retouched. I can live with that. Seeing this image brought me just the notion that I needed: that a good photo is as much about what is left out, as what is framed. Ever notice that good monster movies keep the suspense up by NOT revealing the monster right away? They hint, they tease, they imply, and as such the audience is captivated by wanting to know what the monster looks like. That’s a trick to engaging content. I realized that while my photos may be ok technically, that emotionally, I was much too explicit. I’ll be working on that for the next little while. A wonderful shot by Connie Arida, pointing out that sometimes the best part of a photograph is what is not included. Quite Oh, Cyborg in the light. 2009-06-13 I was thinking of updating my profile pic. 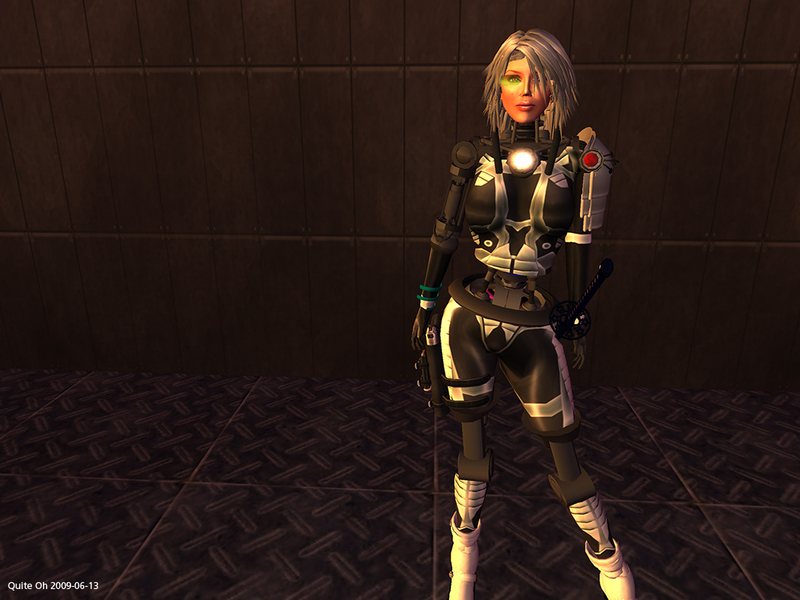 Full body shots are rarely useful for it, but I’d gotten the lighting just-so on this one, so I thought I’d share it. Call it a vanity pic. Unretouched, of course. Please note that this FAQ is a work in progress. Time is limited and I’m doing my best to keep on top of SL and RL. Thanks for your patience. I invite your questions and potential answers to help me complete this. Q: What is the Second Life Pure Photography group about? There are certain classes of people in the world. Most of us, despite how we like to think of ourselves, are common. We live our lives, ordinarily, fullfilling our personal wants and desires and keep on keeping on. Then there are those, who in a particlar area, try to push the limits. Finally, there are those who push those limits and share what they know, selflessly with the world. Zonja Capalini is one such person. She’s a wonderful photographer, does interesting machinma and seems to be an all round nice person. And best yet, she’s actually humble. Nice combination. So why doeth thou gusheth thusly, Quite? Because Zonja helps people learn. We all sink or rise together, when when you find an individual that is of the latter group, I think they should be noticed and in a world where negativity often overrides positivity, they should be publicly appreciated for their actions. Sunshine is free, spread it around! I created the Second Life Pure Photography Flickr group, and joy! She signed up, and posted one of her pics. The picture itself is wonderful, but what struck was was that she freely gave instructions on how to reproduce it. That’s the step above I’m talking about. Most people I meet figure out a little technique, then hoard it and try to sell it for as much as they can while remaining secretive about it. Those are the s(t)inkers of the lot. Zonja is a swimmer. /me stops torturing metaphors and aphorisms now. Zonja seems to have a thing for mirrors. As SL has no native mirroring mechanism, Zonja has gone about trying to reproduce them in as many ways as is seems feasable. Check out Zonja Capalini’s tutorial on creating the Dynamic Mirror Water Effect and when you’ve taken your photos and had your fun, send her a thank you note. SL Pure Photography Flickr Group is born! I’ve created an open group on flickr.com for pure Second Life photography. Here is the group’s charter. The mission of this group is to raise the bar on Second Life photography, to really push our vision, skills and technique in taking in-world photographs. It is to entice, challenge and celebrate Second Life artistic photography that is "pure", meaning that it has zero post processing beyond cropping for aspect ratio and resizing. We want to raise the bar on Second Life photography. Inspired by the Best of the Best Second Life photography group, we will be limiting this pool to an as-of-yet undefined number of photographs of the very best, most stunning and realistic photos possible, using The Way of the Purist. Probably 1000, and each will have to compete for it’s place. When you post an image, tell us HOW you did it. Give us the specifics of the implementation of the technique so that we can reproduce your effect. Some people may fear giving away what they consider to be a secret. Consider it otherwise: you are demonstrating your skill and originality and crediting yourself as someone who is learning and moving beyond the common screenshot. Each thing you learn, share and teach raises your status as a photographer. While we are very impressed by the creativity and technical skill that so many here posess in using image editors to retouch images, none of these images will be accepted. These are better suited to digital art groups. Filters, effects, cloning, blurring or any other technique used to enhance a photograph that was not 100% generated in-word and taken as-is will be disqualified. It if wasn’t generated in your client, it doesn’t fly, and sadly we will disinclude it from the pool. This group may have artful nudes, but consider that if you wouldn’t want your neighbour to show it to your 5 year old daughter, this is probably not the place for it. I have not yet put the final details in place, but, for the moment it’s there. I look forward to seeing how people push the envelope and the challenges to my own sense of vision of skill. Let’s have fun and learn! SL Pure Photography Flickr Group can be found here.